For the last eight years, Benedictine College has held its Symposium on Advancing the New Evangelization on its campus in Atchison, Kansas. The event attracted about 300 scholars, students and concerned Catholics on March 29-30, 2019. 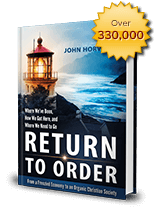 The theme of this year’s symposium was “Technology and the Human Person.” John Horvat II, author of Return to Order, was one of the featured speakers. Mr. Horvat presented a short paper titled “The Frustrations of Technology.” He showed that while technology facilitates material progress, it also represents challenges to the dignity of the human person and the search for meaning. Abuse of technology also sustains a mindset that is anti-metaphysical. Human nature is organic and oriented toward God, but modern technology clashes with its spiritual side. During the Industrial Revolution, a technological paradigm shift changed lives by introducing a mania for speed, nausea for reflection and an obsession for shallowness. The author addressed a Catholic response to the abuses of technology since a Christian society naturally tempers technology’s excesses through the practice of the cardinal virtue. The Church also challenges the anti-metaphysical premises of technology with a worldview that makes the universe intelligible. 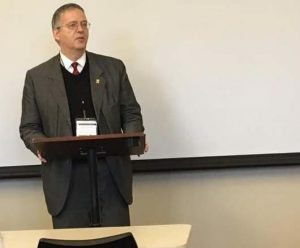 Scholars from 33 different academic institutions, professional organizations and diocesan offices presented papers during the two-day conference that proved to be a great success. Are you interested in a Return to Order presentation for your group or event? To inquire, please send an email to jh1908@aol.com or phone 717-309-7147. This entry was posted in Featured and tagged Benedictine College, Return to Order by Francis Slobodnik. Bookmark the permalink.